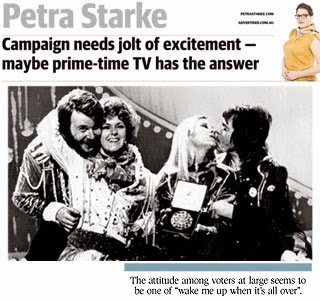 WHEN my four-year-old nephew heard ABBA was running for Prime Minister, he nearly jumped out of his seat with excitement. He’s been a die hard fan of the Swedish supergroup ever since stumbling across a DVD of Mamma Mia! about a year ago, a movie he’s now seen at least 32 times. He loves the songs so much, he doesn’t even mind Pierce Brosnan’s strangled warbling. So when we had to tell him it wasn’t ABBA up for election but Tony ABBOTT, we thought he’d be devastated. On the contrary. in 14 years, a thought I’m sure is no end of comfort to him. We told my nephew about Kevin Rudd as well, but he didn’t seem to care much, so it seems he’s echoing much of the national electorate. Maybe Antony Green should hire him as an official election barometer for the ABC’s coverage on September 7—he’d fit easily on the end of the desk, and he loves to chat. He can sing too, which would fill in any awkward gaps during vote counting. Anyway, my nephew’s reaction to our prime ministerial candidates is pretty much the most excited I’ve seen anyone about anything to do with the election since it was called on Sunday. In general, the attitude among voters at large seems to be one of “wake me up when it’s all over”. It seems voters are already so tired of the whole palaver they just want to cast their ballot and be done with it. Clearly, we need an election gee-up. The political equivalent of a triple shot espresso, or a giant can of Red Bull. Or, in my nephew’s case, a 24-hour ABBA marathon. I know we Australians are a laid-back people, but if we’re too tired and bored to get fired up about who’s going to run the country in five weeks, I’d say we’ve gotten a bit too horizontal. You know what we do seem to be fired up about? The X Factor. About 1.5 million people are tuning in to Channel 7’s reality TV talent show. A couple of weeks ago Nine’s The Block Sky High raked in almost 3 million viewers for its finale, and Big Brother isn’t doing too badly either. All of which got me thinking: maybe what this election needs is a makeover, taking its cues from TV shows. anecdotes about his dad the longest is declared Prime Minister. Big Brother: Both leaders are dropped into the Big Brother House where Abbott is made to live in a tent city with the “have-nots” and protect the swimming pool, while Rudd stays inside and refers all intruders to another house down the road. Under the Dome: The ALP and the Coalition are encased in a giant glass bubble until they create their own functioning ecosystem that renders the carbon tax irrelevant. The Block Sky High: Rudd and Abbott go head to head renovating the country’s broadband network for the cheapest cost possible. Winners & Losers: Roles yet to be decided. First published in The Advertiser, August 8, 2013.